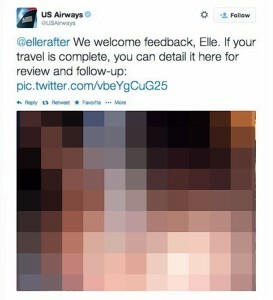 Social Media blunders like Monday’s US Airways make for huge headlines these days. The damage to a company’s reputation costs millions in lost revenues. Online reputation management is the arena where these issues are addressed and conquered. Can managing a company’s online reputation cure the problems caused with extreme social media blunders? What about preventing them in the first place?! Is it possible that Reputation Management can be used as both prophylaxis and cure when the unthinkable and unpredictable happen in cyberspace? In every case in recent history of a company suffering damage to their online reputation through Social Media (it seems to always be Twitter…) the event(s) happen during some sort of customer service meltdown. A well thought out and executed Online Reputation Management Strategy must include addressing these events quickly and decisively. Does it make them completely preventable?! A complete and well implemented strategy can come very close to making disasters completely preventable. Also making the small percentage of incidents that do occur, into not just non-issues, but can make many of them into positive influences of how the public sees that company. With the US Airways event, we have yet to be told the facts as to who was responsible for Tweeting a pornographic image to address a passenger complaining about delays that resulted in a flight being over an hour late in arriving. Once we are informed, most likely one of two things will be disclosed. 1. Their Twitter account was hacked, and someone will be fired that was either responsible for US Airway’s Social Media site security or an outside Social Media firm will be let go pending litigation against them. 2. An actual customer service person will be fired and possibly face legal action for their actions in the matter. Most businesses will never face a situation of this magnitude, but can your company afford even one-tenth of this negative press? Prevention of damage to your business’s reputation requires openness and candor as a standard operating procedure. This alone prevents customer service mix-ups from progressing to the point where customers OR employees have their tensions raised. We all know the speed with which things spread across Social Media in general, and Twitter specifically! Click the button at the side of this page and request yours now with the speed of a Tweet!